From the parking lot of Disney’s Hollywood Studios, guests’ eyes are immediately drawn to the towering Hollywood Tower Hotel. Once guests get through the initial surge through the park gates, they can’t help but notice the Sorcerer Mickey Hat resting at the end of Hollywood Boulevard. In between, however, as guests wait to enter the park, or as an annoyance that they have to make your way around as they race off to their first attraction, there is one park icon that cannot be ignored, the Crossroads of the World. 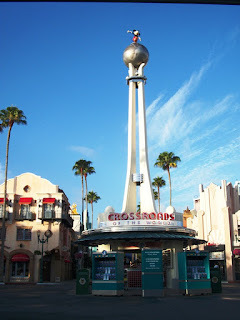 The Crossroads of the World in Disney’s Hollywood Studios is actually based on a real life landmark. 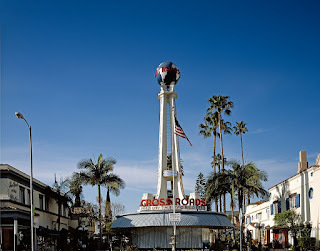 The original Crossroads of the World has been sitting at the crossroads of Las Palmas and Sunset Boulevard in Los Angeles, CA since 1936. Walt Disney may be one of the most recognized names in thematic design, but this structure created by Robert D. Verrah is one of the first examples of such a design style. The Crossroads of the World was designed to embody the feel of a cruise liner, while actually housing a shopping mall, one of the world’s first shopping malls to be precise, and did not stop at the first towering kiosk that is recreated at Disney’s Hollywood Studios. The main building, as well as other smaller bungalow out-buildings, housed a variety of shops with an international flair. The differences between the original 1936 spire and the 1989 version at Disney’s Hollywood Studios are subtle, with one not so subtle variation. There is no Mickey strolling along the top of the Crossroads of the World in Los Angeles. Additionally, Disney’s icon lacks some of the design flourishes found on the pillars, the bracings in between them, and the wavy awnings are slightly different, but the feel when you look at the two icons is dead on! Today, Los Angeles’ Crossroads of the World no longer beckons to worldly shoppers, but instead is home to office spaces for producers, writers, costume designers and other entertainment types. This leaves the small souvenir kiosk at Disney’s Hollywood Studios to stand as not only a beckon to the Hollywood of old, but also as a reminder of the original Crossroads’ purpose. Roundtable Contributors: Elizabeth Caran (Outlander Travel), Alan Mize, Melissa Sue Sorrells Galley (Mouse on the Mind), Blake Taylor (BlakeOnline.com), and yours truly. In the tradition of their past viral video hits (Bohemian Rhapsody, anyone? 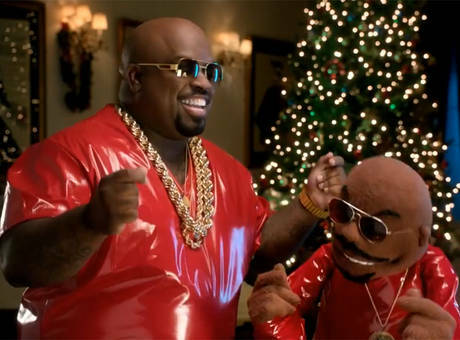 ), on Monday the Muppets debuted the music video for their new holiday single with CeeLo Green, "All I Need Is Love." The song, which appears on the new album CeeLo's Magic Moment, was given major publicity buzz this week with exposure on Good Morning America, The Voice, and Green's own Christmas special. The music video, running longer than the song's length at a glorious 7 minutes, is Muppets galore and lots of fun. But what does this have to do with Walt Disney World? On the surface, nothing at all. Looking deeper into things, though, Disney has invested a lot into the Muppets franchise's potential over the last several years, peaking with the release of the feature film The Muppets in November 2011. With the massive frenzy following that movie (an Oscar win and a currently-in-production sequel among them), it's not a stretch to think that the next logical step for Kermit and company could be the Disney Parks. The interactive adventure game onboard the Disney Fantasy proved the Imagineers' interest in the characters, so I can't help but wondering if there are more exciting Muppet projects in the works. Something similar to the Cruise Line's adventure game seems ideal for Hollywood Studios, which has yet to debut an interactive mobile game like the Magic Kingdom and Epcot have. If we're dreaming big, a fully-realized Muppet eatery in the location of Pizza Planet could be exquisite (complete with sounds of the Swedish Chef's cacophony coming from the kitchen doors). For now we'll have to be content with Muppet*Vision 3D, though I wouldn't be surprised if more Muppet fun pops up in the Parks in the next few years at the pace this franchise is escalating. When the two-credit signature restaurant in Epcot's France Pavilion reopens in December, it will bear a new name: "Monsieur Paul." The dinner-spot formerly known as Bistro de Paris will be renamed in honor of Paul Bocuse, one of the three chefs who started the restaurant. A fitting tribute to a beloved chef, to be sure, but I just hope they don't get rid of the warm chocolate and almond cake. This week, it was announced that Epcot’s interactive game Agent P’s World Showcase Adventure would be expanding its Horizons (see what I did there?). This replacement to the old Kim Possible World Showcase Adventure debuted earlier this summer on a limited basis but new elements have been installed in the Mexico, United Kingdom and Japan pavilions and they are ready to be rolled out in the coming weeks. While I never took the opportunity to play the Kim Possible World Showcase Adventure, and I haven’t yet had an opportunity to see the Agent P version, I have heard great things about these interactive games. Epcot is my favorite of the four theme parks at Walt Disney World, so I don’t need any additional motivation to spend time there, but I can see why the park in its current state may be less than thrilling to a child. Agent P is an extremely popular character with both kids and adults and this interactive game will surely keep the younger Epcot guests entertained while wandering World Showcase. Plus, while they’re walking through the different countries and playing the game, maybe they’ll learn something while they’re at it. After all, edutainment was one of the foundations of Epcot Center 30 years ago so a little more of that wouldn’t hurt. Although my skills in the hard sciences are regrettably limited, I do geek out when Disney technology gets way cool, and a piece appeared in the Washington Post this week that completely got my inner nerd whooping and hollering. It seems that Disney research has been able to take the Audio-Animatronics figure one step closer to Asimovian proportions by programming one to play catch! That's right... perhaps one day soon in a theme park near you, you will be able to toss a ball back and forth with a computer. The figures can even do partner juggling. And if they miss a catch? They are programmed with subtle reactions of shame, confusion, or even indifference. The reactions real people have to playing catch with a robot, even in it's skeletal form, are remarkable. No telling how far this is from implementation, but I personally cannot wait to queue up for my chance to play catch with... Abraham Lincoln? Mark Twain? Walt Disney? The possibilities are endless! 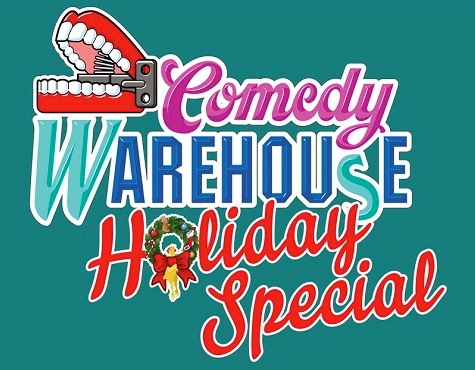 It was announced this week the Comedy Warehouse Holiday Special will be returning to Disney's Hollywood Studios. Last year the Pleasure Island alum were granted a week long showcase at the park, but this year they have been granted a larger amphitheater and a two week engagement. 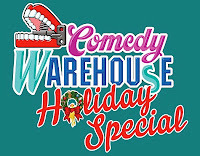 After only one year, the show is already one of the top holiday draws in the park, which tells me that perhaps it is time to throw open the doors of the Comedy Warehouse down in Pleasure Island once again! Interacting with the audience/guests is a hallmark of Walt Disney World entertainment. The residents of Main Street, the World Showcase Players, and the streetmosphere personalities of Disney's Hollywood Studios are all integral parts of the park going experience. Walt Disney World learned from this and created unique shows and interactions when they originally opened Pleasure Island with the Comedy Warehouse and Adventurers Club. Now, I understand that Walt Disney World had other plans for the spaces of Pleasure Island when they shuttered the clubs, and I know that trying to come up with a solution to loiterers and families without cutting off the walkway between the Marketplace and West Side is not easy, but Pleasure Island feels about as remarkable as a parking lot at this point. I'm not asking to return Pleasure Island to its previous state, but it should just be left sitting like an open wound either. Clearly the comedy stylings of the amazing cast from Comedy Warehouse strikes a chord with guests, why not start revitalizing Pleasure Island by reintroducing them into a regularly scheduled show there? The Italy Pavilion has been doing a yeoman’s work over the past several years to inject one of the country’s main exports back in the forefront of the pavilion, cuisine. From an overhaul of Tutto Italia to the new pizzeria, Via Napoli, there is barely a corner on this pavilion that has not seen the addition of a world class eatery. 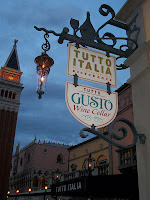 Today, we’re venturing into the cozy wine cellar known as Tutto Gusto. The first thing you will notice upon entering the wine cellar is that it has a very warm feel about it. There are large plush chairs, dark wooden tables, and the stone walls and pillars that should make this a dim, quiet space. However, there is warm cheery lighting, my personal favorite are the lamps made from wine bottles, and a bright display case which keeps Tutto Gusto feeling welcoming and friendly. Tutto Gusto had been open for a few months when I was finally able to stop by, and I very much wanted to get the full experience, which means wine and a smattering of small plate items. When the wine cellar first opened, guests were able to select a variety of meats, cheeses, and other charcuterie elements, including olives and salads. The ability to order items individually is still an option, and I especially recommend the olives, but Tutto Gusto has worked very diligently to come up with some sampling plates that are perfect for sharing. My group selected the L’Alpina and La Maiala plates. 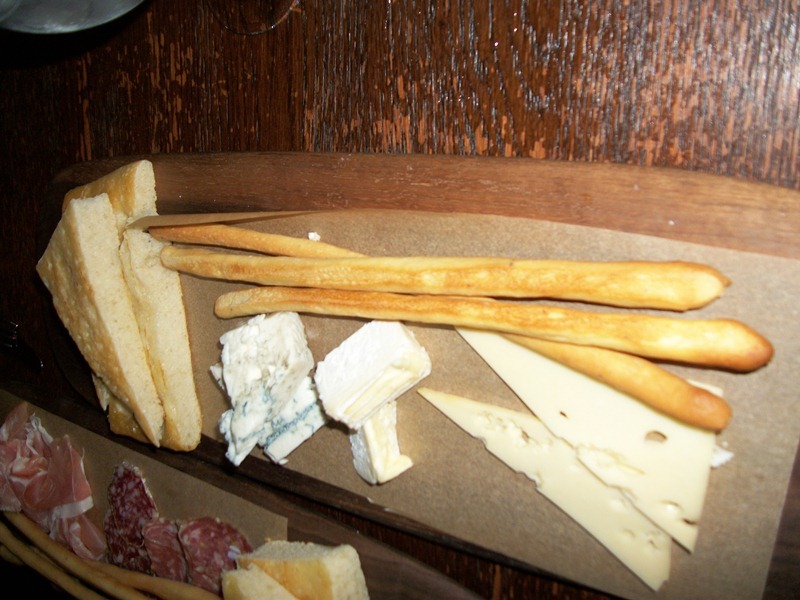 L’Alpina is a cheese plate which features cheeses that hail from Italy’s northern province of Piemonte. The plate included a Fontina Valdostana , a semi-firm cow’s milk, La Tur, a creamy blend of cow, sheep and goat’s milk, and a Gorgonzola Cremificato, a sweet blue cheese. Some were saltier than others, one offering was very smooth and perfect for spreading, while another was more brittle and perfect for nibbling on, but that is the joy of small plates such as L’Alpina. In fact, of the group I dined with, we all had very different opinions on how each cheese ranked alongside the others, but we all agreed they were all exquisitely crafted. 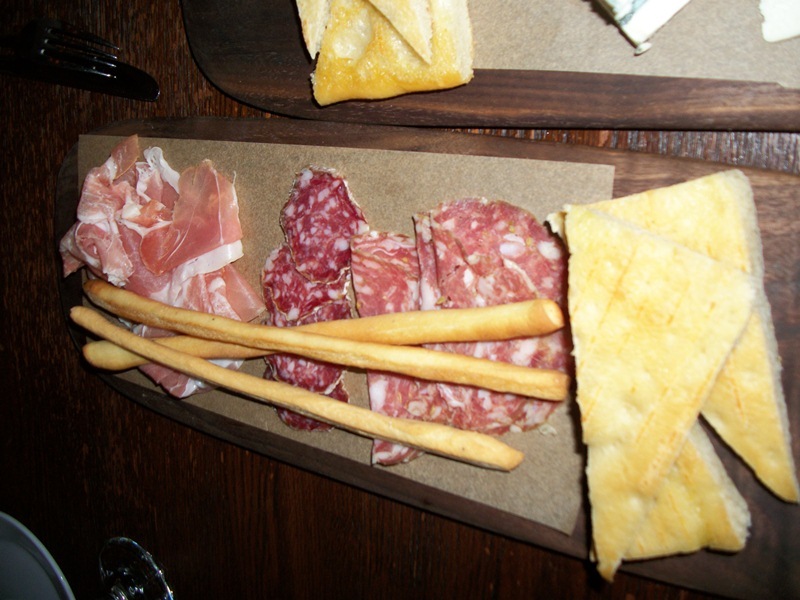 The same held true of the La Maiala plate, which included a selection of salted and cured meats from Chef Barcatta. The Chef has excellent taste, as well all thoroughly enjoyed each of the three meat offerings. This plate included Prosciutto di Parma, an aged dry cured ham, Finocchiona, a fennel and peppered salame, and Salametto, a small, dried, and spiced pork sausage. Each of the plates also included a suggestion for a wine flight that would pair well with the components of the plates. The flights at Tutto Gusto are not simply thrown together, but hand-selected based on region, type of grape, or seasonal flavors. For my part, I went a bit off menu and tried the special wine flight that was announced on a card at the table, but not on the menu. It was called Old Face, New Places for its inclusion of recognizable grape varietals, but in a new composition. The flight included 2 oz. 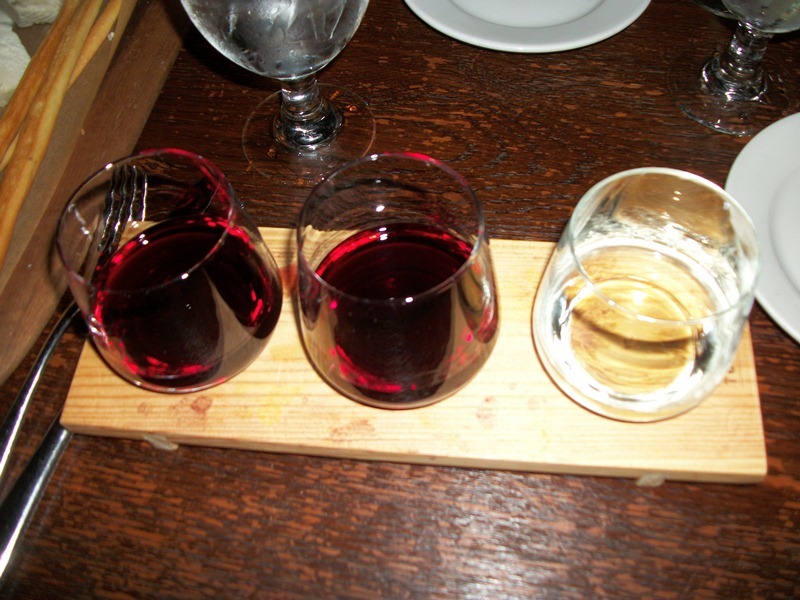 pours of a Chardonnay, a 2010 Tenuta Di Nozzole ‘Le Bruniche,’ a Pinot Noir, a 2009 San Giuseppe, and a Zinfandel, a 2009 Primaterra Primitivo. So, what do I mean by ‘new composition’ of the wines? As a general rule with white wines, particularly Chardonnay, I like a crisp wine. In the case of the Le Bruniche, however, I found a buttery wine that felt comfortable just resting in my mouth and that had the feel of liquid sunshine to it, as silly as all of that sounds. The Pinot Noir was dark, which I expected, but also a clean, light feel to it. In other words, it didn’t linger on my palate as most Pinot Noirs do. I tend to like Old Vine Zinfandels, and the Primitivo, the original grape of California’s Zinfandel, is probably about as old vine as you can get, and I loved every sip of it. Tutto Gusto has many other food offerings, including sandwiches and pasta dishes, but the small plates with some fantastic wines will always gobble up my attention. Tutto Gusto may not be the perfect place to dine with your family, but for a quiet, romantic pause, or a place to sit and talk with a group of friends you haven’t see in a while, this is the place to be. I have yet to sample anything at Tutto Gusto that would leave a bad taste in my mouth, and I’m willing to bet I’ll never find that dish or glass either. All right folks, in a little less than two weeks I’m going to turn the big 3-1! That is to say a birthday without a whole lot of oomph behind it. So, I’m going to turn the Main Street Gazette over to all of you that day. Between now and Friday December 7, send me your questions and I’ll answer them for you, but I have to get at least 31 questions. Ask me anything! Want to know who I think would win in a battle between Darth Vader and the Doctor? Done. Want me to expand upon the geodesic design element that runs rampant through Epcot? Sure thing. You really really want to know what my favorite song is? Got it. So email me, tweet me, drop the questions onto my Facebook timeline, but make sure I get at least 31 questions! Now, if I get more than 31 questions, I’ll randomly draw 31 from the pool I have. If I don’t get 31 questions, you’re not going to get any answers, only an article about a gallery I adore that happens to reside somewhere in Walt Disney World. How’s that for inspiration! If you have been a fan of Disney, its parks and films, for any length of time you are probably familiar with Disney On Ice. This traveling ice skating show brings scenes from popular animated features with skaters in full costume. If you aren’t familiar with the shows, picture your favorite meet-and-greet characters, say Aladdin’s Genie and Jafar, strapped with ice skates acting out their most popular songs. Yeah, it’s tricky for sure. However, did you know that once upon a time, ice and Disney combined in a totally different type of experience? 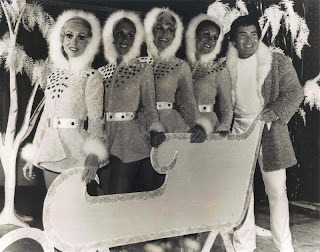 Top tier ice skaters ventured onto a man-made rink at the Walt Disney World Village in 1979. Stars On Ice featured feats of incredible ice dancing choreographed to holiday standards and classics. In addition to the professional ice skaters, there were also a few Disney characters, such as pink elephants, that paraded about during the festivities. The ice rink took shape on the Village Stage, and the Stars On Ice show was presented 3 times an evening at 5:30, 7:00, and 8:30, between November 30 and December 9, 1979. If you wanted more out of your holiday festivities at the Walt Disney World Village in 1979, you could hang around after the 7:00pm Stars On Ice show for a awe inspiring treelighting ceremony. There was also a living Nativity scene put on twice a night at the Village between December 14 – 24 that year. Need more? Later that December you could simple head on over to Top of the World at the Contemporary Resort for headlining acts that included Phyllis Diller, Bobby Goldsboro, and Mel Torme! This is all in addition to the Very Merry Christmas Parade, Candlelight Processional, and all the incredible decorations at the resorts and Magic Kingdom. It may be the most wonderful time of year, but it was also a very busy time of year in 1979!